… I pencilled in a note to Meredith who was in the middle of a skype conversation. Waltzing over there for a quiet read I was stopped in my tracks when I spotted what looked like a colourful belt lying across the entrance. It was a beautiful snake. We looked at each other for a minute before it swung round and started to slither into the building. They can move with a surprising speed but so did I–over the threshold–sort of tippy-toe. I beat him/her inside but didn’t stop it proceeding in a slinky snake-like fashion round the edges of the door and along the length of the small Ikea kitchen in the direction of the bedroom–ie away from me. We both had a dilemma. 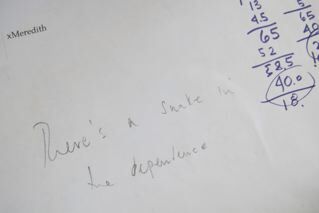 For the snake it was–“where can I go to get away from him?”. For me –“what shall I do to get him/her out of here?”. I couldn’t pick it up–I didn’t have one of those forked sticks you see snake handlers using to handle snakes humanely. The snake coyly slunk along the skirting board of the kitchen looking for an escape, at one point considering the small mat in front of the sink–too small it decided quickly. It then spotted the dishwasher and seemed to slide effortlessly inside it–from underneath. Strange I thought–it’s a dishwasher–surely it can’t have gone inside–that would mean water could gush out when it was used! Such was my state of disorientation as a result of having a wild animal on the premises, that two or three minutes after it had disappeared, I actually opened the dishwasher to check. I realised it had slid up into the space between the skirting board and the dishwasher. I got down on my knees and saw there was a gap large enough for a snake to slink. I didn’t fancy putting my fingers into the gap to prize the skirting board back–so I sat down. I thought if I stay quiet and still, it’ll surface again–I’ll be able to guide it to the exit. I left it in occupation–with the door open–hoping it would make a dash for it overnight. –which “prefers dry, sunny open situations that also offer shelter”–to scary spots behind the skirting board! Late this afternoon we return from a lunch date and are given the all clear by our friend Mitch–who was brave enough to sneak a look behind the skirting board. Must have slipped/slid away under cover of darkness, in search of more congenial accommodation. I’m glad you didn’t kill it. We’ve had loads of snakes here and I once read in a Feng Shui book that if a snake comes to your house, don’t kill it, leave it alone and it will go away. That’s what they do. Never fear. I’m sure you woulod be a lot happier if you knew EXACTLY where he/she is now! Just to be sure, check the blankets before you go to sleep. If anything moves and it’s not your feet………. Hi Robin,A snake can be scarry, for sure in the house.Normally your cats would found out where he/she sits.Some cats are afright of it, some catch them.But watch out for bites (Adder-viper with the X or V in the neck). Good luck, keep your bedroom clossed, look also under the bed.Many regards from Belgium.Chantal. Hate to be a killjoy, but the very snakes who love basking in the sun, also take up residence in the walls, cellars and other places they can slither into in houses. Don’t have familiarity with snakes in France but in the States in different parts of the country this is an all too common occurrence Any kind of animal control officers who could come in and take a look, in your neck of the woods Robin?. 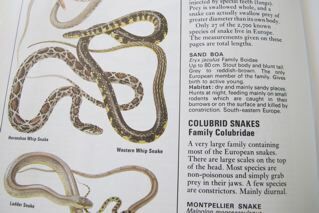 Hello Meredith & Robin – you are very brave the thought of coming upon such a thing as a snake would give me nightmares. Are there dangerous poisonous ones in France? Maybe there others too…where there is one…? I hope I’am wrong. Includes photo from the NEW Poldark series! An annual act of Remembrance in the depths of rural France. A Review of Robin's cookbook! Before Downtown Abbey there was Poldark!